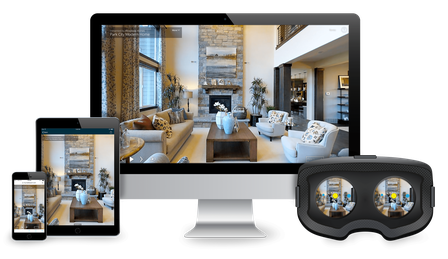 Thanks to the Matterport all-in-one capture system, we can produce realistic, interactive 3D and VR experiences that as real as being there. We can scan the space quickly and recreate it in three-dimensional reality, allowing you to visit it whenever you like either as part of a guided tour or explore it at your own pace. The technology allows you to navigate freely, explore every floor, room and corner. You not only get the flow of the space but an opportunity to immerse yourself in it. By using a VR headset, you can even experience being inside the space. The scanned environment can be easily integrated into your website and shared on social media. Plus, if required the digitalised space can be incorporated into Google Street View, which with a click of the button will allow your space to be visited from the outside. For complete immersion, the content can be adapted to VR 360° and viewed using a virtual reality helmet.